Taking care of our teeth and our oral health in general is a major part of maintaining our overall health. For most people, their dentist serve as their personal tooth fairy to ensure that they maintain healthy teeth and gums. However, it is at home that we should diligently do all the things we need to do to maintain our health including brushing our teeth regularly. 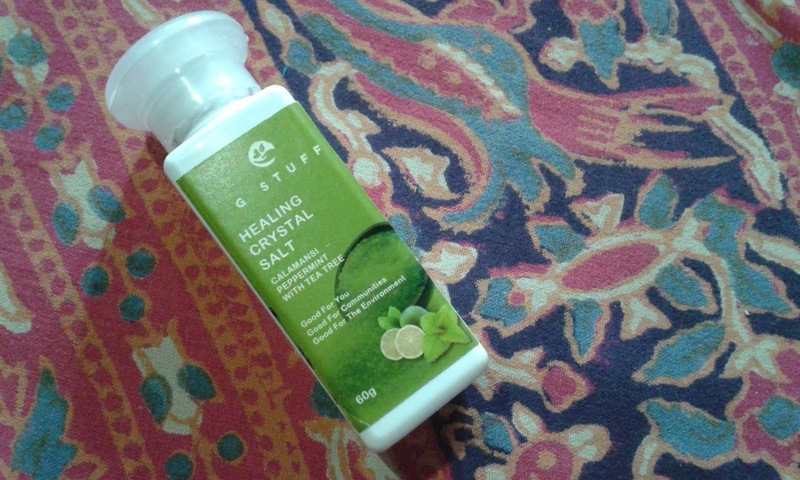 G Stuff Healing Crystal Salt is my personal tooth fairy at home. I go to a dentist too but at home I rely on G Stuff Healing Crystal Salt to keep my teeth and gums clean and healthy. I consider this stuff to be my own personal tooth fairy and using it has given me good results. Commercial toothpastes were part of my oral health care products before but I had decided to switch all my personal care products to natural and organic ingredients and if there was a local brand that offered these, I prefer to buy it from them. G Stuff is one such brand and I have used and still use a lot of their products which I will tell you about later on. For now, here's my experience with using their Healing Crystal Salt. The crystal salt is actually a fine white powder that turns into a pasty consistency when you press the bristles of a wet toothbrush into the powder. Whatever adheres to the bristles is what you use for brushing your teeth. For most of us who are familiar with the minty, sweet taste of commercial toothpastes, it may come as a bit of a shock to get a salty but still slightly minty taste from the powder. It's not too salty to make you gag. I've tried saltier-tasting tooth powders so this one is mild compared to those. You will eventually get used to it and will start to like it. I don't remember how much the small 60g bottle costs but the 120g bottle costs Php270. I have experienced many benefits from using this as my toothpaste. Whenever I feel a toothache or get sensitive teeth, I use this as my toothpaste and use lukewarm water to rinse my mouth after brushing. The pain goes away after 2-3 days. My teeth have also improved in color. They are not sparkling white like in toothpaste commercials but they are lighter in color and any stains I had before have gradually faded and has evened out. During cold months, I usually get very dry lips and the corners of my mouth often get so dry that they bleed. I have not experienced that since I started using this product. No more mouth sores too. One notable experience I had with this product was when I had wisdom tooth surgery. Healing the affected area normally takes around 2 weeks but my dentist was amazed when he checked me again a week right after. The area had healed so much to the point that the wound from the surgical cut had already fused together and the cut line was not visible anymore. He asked me what I did, I said that I did not use commercial toothpaste anymore and of course I accompanied it with a healthy diet. This said, there are some things that may surprise you after using this. I noticed that I have grown allergic to commercial toothpastes since I switched to this. Whenever I use commercial toothpaste, I get dry lips and the corners of my mouth bleed. This happened a couple of times when I travelled and was not able to bring my tooth powder. I don''t forget to bring it with me since then. This may just be me however, but I find it a good thing because it compels me to stick to my organic product. You may also notice the absence of bubbles. When you brush your teeth, you do not get the sudsy effect of commercial toothpastes. It's just the basic feeling of rubbing fine crystals unto your teeth. The crystals dissolve as you brush so it's still as convenient to use like commercial toothpastes. But packing it into a small container when traveling takes up less space than a regular toothpaste tube so I think its more convenient this way. The G Stuff brand has many other product offerings. I will be posting more about the organic products that I use from them and from other brands in my next posts. In the meantime, don't forget to brush your teeth and keep healthy.